Inspired by the ocean’s energy, Richard Glass handcrafts this set through a unique process. For maker Richard Glass, this eye-catching set is his own "version of an abstract seascape." Inspired by the ocean's swirling, tumbling waves, he crafts each glass from clear crystal, layering in bits of colored powder that twist and fold in the kiln. 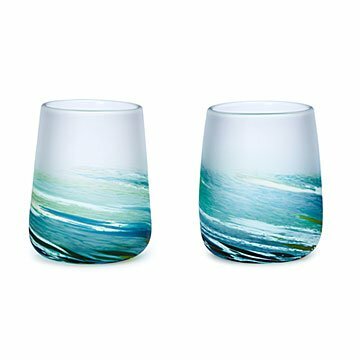 When the glassware cools, it's sandblasted, giving it a unique frosted finish that feels analogous to mist rising up from the sea. A wonderful gift for new home owners or coast-craving loved ones, it gives dinner parties a touch of deep blue magic. Handmade in Devon, England. Loved the glasses and bowl! We gifted them to our exec as she departed and the next day she sent us a photo of the wine glasses in use on her porch overlooking the ocean!